Mobile phones are great. The sheer number of things you can do with them these days is quite staggering. But, one thing they aren’t so good for is actually using them to make calls. They’re small and thin so can be difficult to keep a firm grip on, and are next to impossible to wedge inbetween head and shoulder. Then there’s the health risks of holding a phone next to your head. The research may largely be pointing towards there being little risk to humans but there’s still an argument for saying we should avoid exposing ourselves to the microwaves that are your phone’s signal. All of which has lead to the situation we’re in today where you can buy a wealth of accessories that turn your sleek, slender, pocket friendly mobile phone back into a large, desk-bound device that’s actually nice for calling. And, just such an accessory is the SwissVoice CH01. This stylish plastic phone shaped device plugs into your mobile’s headphone jack and takes over voice-in-and-out duties. It can also be used to control volume, skip/play/pause tracks if you’re listening to music or answer/start a call. Available as either just the handset (CH05) or with a plastic base/cradle (CH01), SwissVoice has certainly got the first part of the phone accessory equation right – it’s stylish! It’s available in TR orange? Well then it must be good! Following the same design ethos as the company’s standard Dect phones, the handset is angular and hollow, with a range of colour options – blue, green, orange, pink and white – available for the middle. The effect is really charming, marrying a retro vibe with a suitably modern feel. It’s pretty compact too, with the whole assembly having a footprint little bigger than the handset itself. Build quality is pretty good too. The glossy plastic looks and feels great while the various buttons and other features are all well seated and tough. For instance the attachments for the cable are strong yet flexible, suggesting they’ll last a good while before inevitably giving way. Meanwhile the buttons have a good, solid, discernible click so you’re sure when you’ve pressed them. The base of the CH01 also ticks all the right boxes in terms of design. 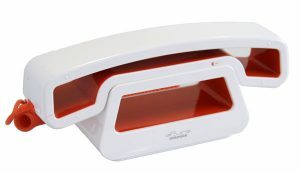 It’s nicely finished with a matching style, has four grippy rubber feet to prevent slippage and it’s weighted to stop itself being pulled off the desk when yanked by the phone’s cord. We found that if planted on a not-too-slippy desk the phone cable could extend from its standard slack 45cm or so to around 1.5m before starting to pull the base with it. You can use the base as a completely dumb rest and plug the handset straight into your mobile, giving you the option of walking around completely untethered, or you can plug both phone and handset into the base so that the base acts as an anchor for both. The post SwissVoice ePure CH01 appeared first on Trusted Reviews.